She a fat old broad, more than a 1,000 years old. Her special status is a result of her massive girth – 35-foot trunk circumference with a 90-foot crown – than her 45 foot height. 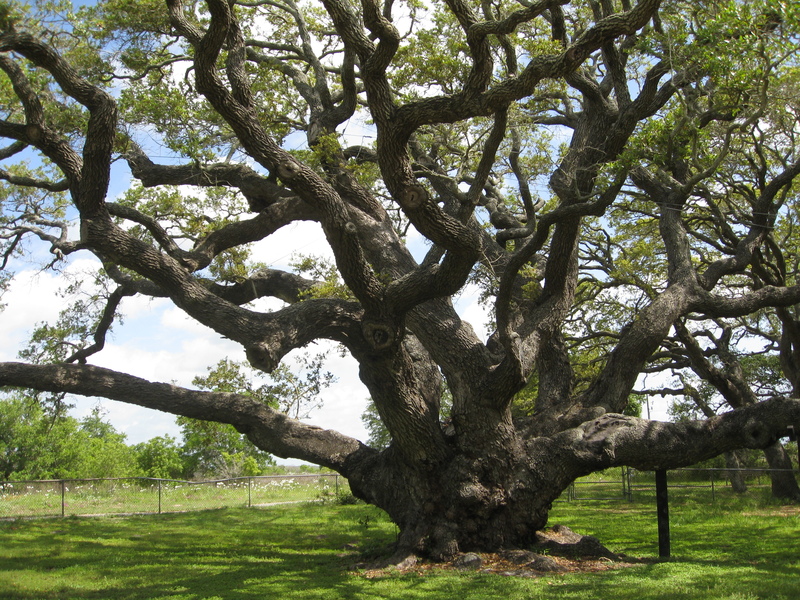 Many live oaks are taller. It’s the combination, note the tree experts, that won her the title, State Champion Coastal Live Oak, in 1969. You now have proof. Pat Bean is a tree hugger. This tree grows in Custer State Park in South Dakota. -- Photo taken by a fellow traveler, right after I took her picture hugging the same tree. I see trees as living art. In summer, their green coolness is a Monet painting; in autumn their bright purple, red, orange and yellow leaves belong on a Gauguin canvas, and in winter, their stark dark and light pattern of limbs remind me of an Escher. I even have several photos of me with my arms around a tree that I asked the occasional travel companion to snap. 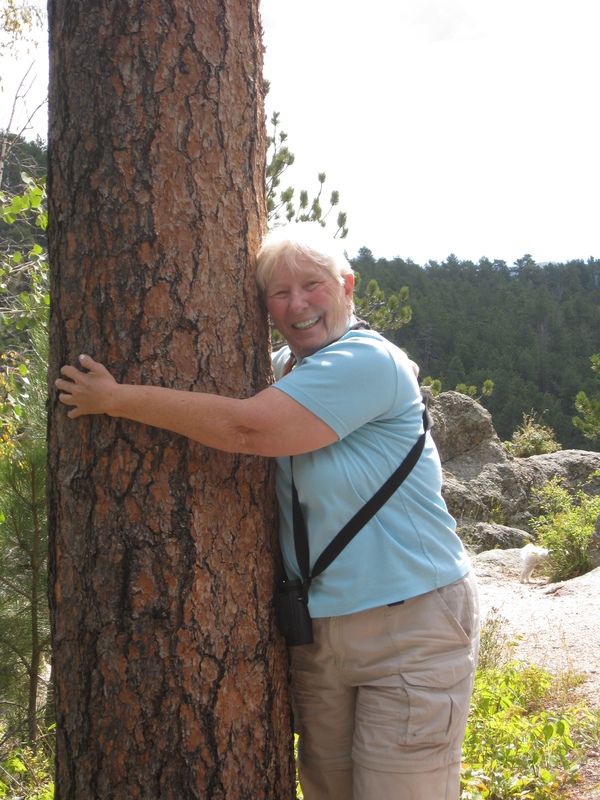 While I might be a bit ashamed to be a “Survivor” fan (yesterday’s blog), I take great pride in saying I’m a tree hugger. Just one problem, Goose Island’s Big Tree is too big for me to hug properly. Why to be ashamed of being a tree hugger. You would find it amazing, In 1970s and 80s, there was a movement in India called “Chipko Movement” i.e. Person would hug a tree to avoid cutting it. The movement saved a number of land from being de-forested. I am so very proud of you Pat for being a fellow tree hugger. We are in the same camp. 😀 What a lovely post and I love the Thoreau quote. Oh! This was interesting! My Grandma, ma’s mother, loved trees. She talked to them. She lived on a large piece of land in the village and had trees everywhere. She planted a tree for her husband and for every one of her children who died. They had large families back then. That land as a child, was a land of wonder and enchanchment and fire-flies. That is one gorgeous old tree! Thanks for sharing it with us.